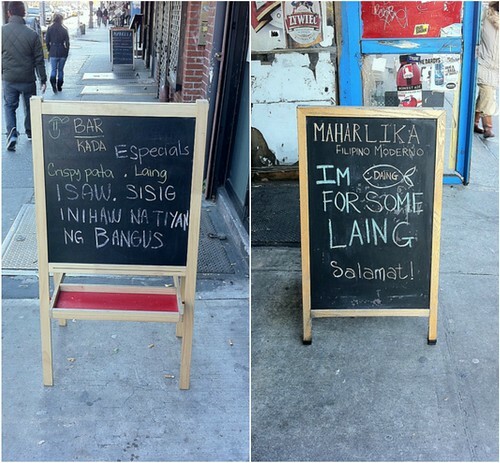 Daniel Maurer Sign boards at Bar Kada and Maharlika on Sunday afternoon. Maharlika has received its share of attention since it went from being a roving pop-up to a proper brick-and-mortar restaurant on First Avenue back in August. “Could it be that Filipino food, the underdog of Asian cuisines, is having its moment at last?”, asked The Times in its $25 and Under review. It would seem so: Recently, yet another Filipino pop-up quietly opened up in the East Village – on the very same block as Maharlika. 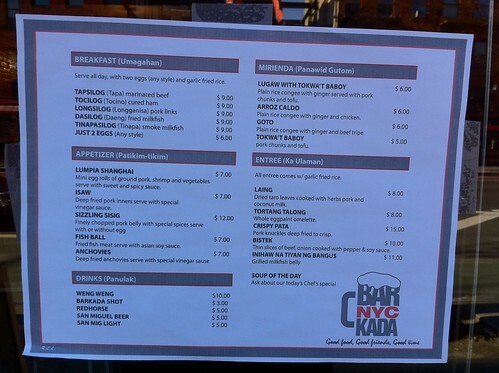 Few seem to have noticed, but last month, Bar Kada took up a Sunday residence at Ugly Kitchen at 103 First Avenue, just a few doors down from Maharlika between Sixth and Seventh Streets. The pop-up is the brainchild of Aris Tuazon, 37, who was until recently the chef at another nearby Filipino restaurant, Krystal’s Cafe 81. Yesterday, Mr. Tuazon said he planned to serve a Filipino menu at Ugly Kitchen every Sunday from 11 a.m. till midnight while he looked for a permanent space in the neighborhood.